People see nature as trees, plants and vertebrates. Yet the world is run by little creatures most people have not heard of; 99 per cent of Earth's organisms are extremely small. For example, some of the most abundant and crucial land animals are the tiny oribatid mites, which are the size of a pinhead and look like a cross between a turtle and a spider. They are a linchpin organism of the environment, but 20 years ago when I set out to identify them no one had heard of them. Back then there were just two people in the US able to identify them. Fortunately one agreed to work with me. Yet we still don't know what the vast majority of oribatids do. A Eupheredermous Oribatid Nymph. 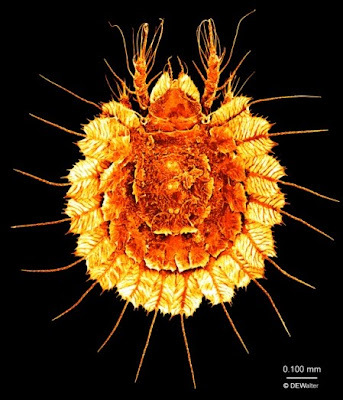 Image from Macromite's blog, which quotes Richard Feynman: "A mite makes the seas roar." P.S. 23 Aug: Archegozetes longisetosus can produce a holding force 1180 times its own weight, making it one of the strongest animals in the world relative to its mass (Heethoff and Koerner via Wiki).